"We share one soul, we share one heart,a perfect time, a perfect start" Rachel Elizabeth Cooper. 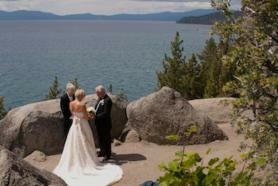 Let the pristine waters and majestic mountains of Lake Tahoe be the backdrop for your wedding. At Lakefront Weddings Tahoe, we perform your ceremony at the location of your choice, while also offering simple packages to make your day special. The Reverend Anne Gerken has been performing ceremonies at Lake Tahoe for 20 years. Being a long time local, she can help you decide on the perfect place to announce your "I do's". She enjoys all types of ceremonies from elopements to 200+guests. Her non-denominational ceremony can be altered to your preference and generally last 15 minutes. Being licensed to perform weddings in Nevada and California, she can travel to any site you choose.